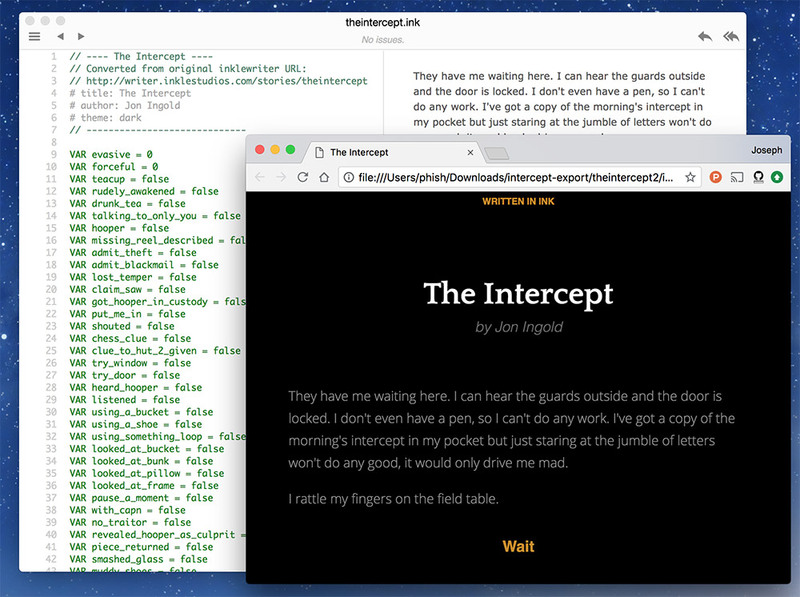 Inky the stand-alone editor for writing interactive Ink stories gets some polish that adds a few bells and whistles to the web exporter, including a tag for inserting images, clearing the screen, restarting the story, and a dark theme. A shiny rewrite of the “Getting Started” tutorial shows off the new export-for-web features and aims to get budding interactive writers in shipshape for the upcoming Ink Jam 2018 on itch.io August 30th – September 3rd. The Ink Unity Integration plugin was updated on July 30th, bringing both up-to-date with Ink 0.8.2. An unofficial port of the Ink Integration Plugin for Unreal is on Github. Further digging will find Python and a few other ports. EGX Rezzed, panel session on the present and future of narrative in games. April 2016. Rock, Paper, Shotgun’s John Walker hosts a discussion on story in games. The panellists are Inkle founder Jon Ingold, Interactive Fiction writer Emily Short, and Chris Gardiner Head Writer at Failbetter Games.